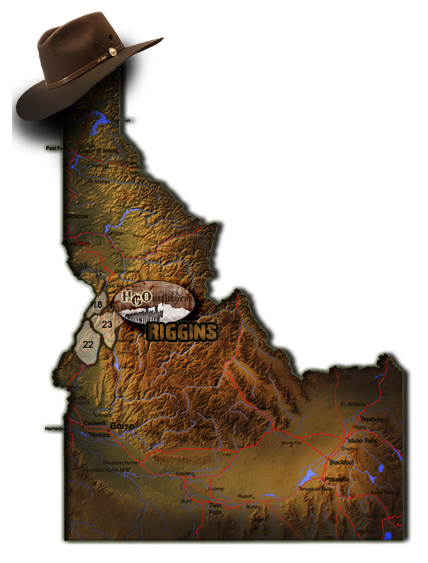 Heaven’s Gate Outfitters has a long history in the Riggins area. We first opened the doors in 1967, where we started with 2 hunting camps spanning approximately 350 square miles of permitted country. In 1995, we were fortunate enough to expand the permitted area nearly 3.5 times to almost 1,200 square miles! We increased our total number of fully-equipped camps up to 5, which now have running water to the cook tents and showers for the guest tents. Each camp has a range of 100 to 150 square miles to cover, which provides our guests with a massive array of choice when seeking out your next harvest. This is a large reason why we have such a significant number of return hunters. In 2011 we have increased our offerings to include many new activities. In the summer we now offer fully guided hiking adventures, supported hiking trips, pack trips and horse camping. We also offer amazing backcountry fishing trips to over 30 high mountain lakes. As always, we still offer horseback rides by the half and full day. In the fall and early winter, we are now offering wild upland bird hunting on over 10,000 acres of privately leased ground. We offer chukar, quail, and partridge hunting on the lease ground and grouse in the National Forest. Check out our 3 days, 4-night special. We also offer trips by the day. There is something for everyone at HGO! Come pay us a visit. Some Activities operate under a special use permit issued by the US Forest Service. Heaven’s Gate Outfitters is an equal opportunity service provider. We offer Color Phased Black Bear hunts in the spring and fall, Mountain Lion, Whitetail and Mule Deer, Archery and Rifle Elk and wild upland birds. We have something for everyone and every ability at HGO. Prices do not include 6% sales tax and 3% Forest Fee tax.